ISTANBUL , Oct 20 (APP): Prime Minister Shahid Khaqan Abbasi and his Turkish counterpart Binali Yildirim Friday agreed to bolster bilateral relations in diverse areas with particular focus on trade and economy. The two leaders, who met here on the sidelines of the 9th D-8 Summit discussed bilateral relations, regional situation as well as other matters of mutual interest. Prime Minister Abbasi while addressing a joint press stakeout with his Turkish counterpart after the bilateral meeting congratulated Turkey for successfully hosting the 9th D-8 Summit and assuming the chair. He said Pakistan and Turkey were close friends and partners and always stood by each other difficult hour. soil to be used against the brotherly country. He appreciated Turkey for supporting the people of occupied Jammu and Kashmir, who were fighting for their right to self-determination promised under the UN resolution. He was also appreciative of Turkey for raising voice for Rohingya Muslims and Palestinians. Both of them were the victims of terrorism, he added. The Prime Minister lauded Turkey for its contribution in the socio-economic development of Pakistan. He extended invitation to the Turkish Prime Minister to visit Pakistan and said he looked forward to the visit. Earlier the two leaders in their bilateral meeting had a frank and candid discussion on ways and means to further strengthen the multi-faceted relations between the two brotherly nations. Prime Minister Abbasi said Pakistan was confident that both as OIC Chair and as an influential power, Turkey would continue to maintain its just and principled position by continuing to call for sending a fact-finding mission to Indian Occupied Kashmir to investigate the gross violations of human rights. He also appreciated Turkey’s strong support for Pakistan’s NSG membership and hoped that this forthright support would continue. On its part, the Prime Minister said, Pakistan will continue to provide all possible support to Turkey on its issues of national interest, including Cyprus. About the situation in Afghanistan, he said, Turkey has always played a very constructive role in facilitating peace through better relations between Afghanistan and Pakistan. “We look forward to Turkey’s initiative of organizing the Pakistan-Afghanistan-Turkey Trilateral Summit at an early date,” he added. The Prime Minister said Pakistan looked forward to working closely with the Turkish leadership on issues of mutual and regional interest. Pakistan welcomes Turkey’s diplomatic outreach efforts to resolve the prevailing crisis between brotherly countries in the GCC, as well as the call for the resolution of all issues through dialogue and negotiations, he added. He also acknowledged Turkey’s role in finding a political situation to the conflict in Syria as well as for graciously hosting millions of refugees. The Prime Minister appreciated Turkey’s leadership in uniting the Muslim Ummah, as the Chair of the OIC, in the aftermath of the imposition of illegal restrictions by Israel around Al Haram Al Sharif and Al Aqsa mosque. “Pakistan and Turkey both share serious concerns over rising tide of Islamophobia and demonization of Muslims. We remain committed to working with Turkey at the international fora in this regard,” he added. 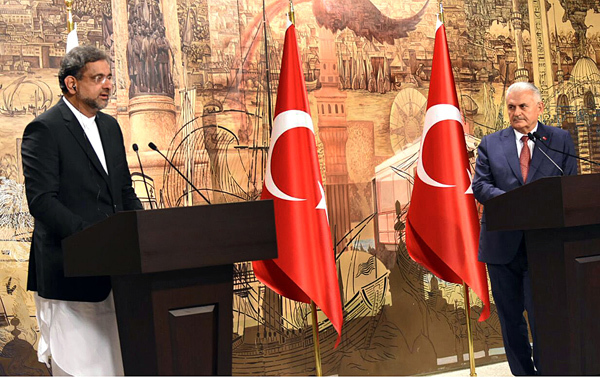 Prime Minister Abbasi who also discussed with his Turkish counterpart the plight of Rohingya Muslims said Pakistan stands ready to discuss and support any initiatives taken by Turkey, as the OIC Chair, to address the plight of Rohingya Muslims. He thanked the Turkish Prime Minister for the participation of Turkey’s famous Mehter Band in the ‘Pakistan Day’ Parade in Islamabad on March 23, 2017 and performance of Turkish Air Force Aerobatic team, Solo Turk on the Independence Day of Pakistan.